OWoN: Politicians won't face it, so a Royal Prince stands up and says what the world needs to hear. 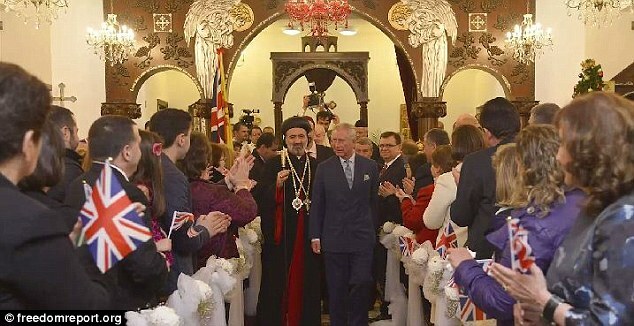 The Princes of Wales has condemned the 'horrendous and heartbreaking' persecution of religious minorities around the world and called on faith leaders to work together to enable religious freedom. In a video address played at the House of Lords, the Prince spoke of his anguish at the plight of Christianity in the Middle East, the region of its birth. The heir to the throne also urged faith leaders to ensure believers have respect for other religions instead of remaining ‘silent’ over the suffering of minorities. 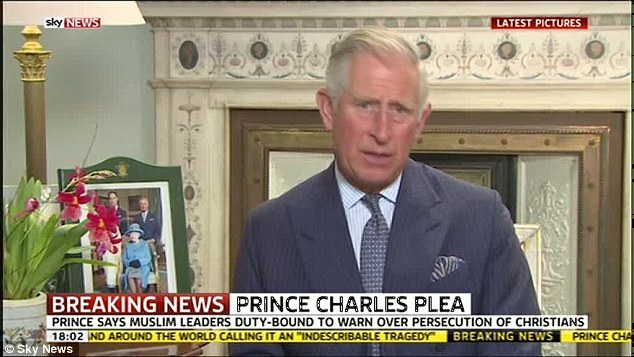 Prince Charles made the remarks in a video message which was recorded ahead of the publication of a report which says Christians are the 'most persecuted religious minority'. Describing religion as central to ‘our future as a free society’, he said the 'horrendous' events in Iraq and Syria had brought the subject of religious persecution 'to the forefront of the world's news' - but that it spread far wider. He said: 'The horrendous and heart-breaking events in Iraq and Syria have brought the subject of religious freedom and persecution to the forefront of the world's news. 'We have learnt with mounting despair of the expulsion of Christians, Muslims and Yazidis from towns and cities that their ancestors have occupied for centuries. He added: 'It is an indescribable tragedy that Christianity is now under such threat in the Middle East – an area where Christians have lived for 2,000 years, and across which Islam spread in 700 AD, with people of different faiths living together peaceably for centuries. Suggesting 'several tangible courses of action', Prince Charles said faith leaders have a 'responsibility to ensure that people within their own tradition respect people from other faith traditions'. He added: 'We have yet to see the full potential of faith communities working together. 'Such efforts aimed at peace and mediation are possible. The report from Aid to the Church in Need highlights the example of a Muslim Imam, a Catholic Archbishop and a Protestant Minister coming together to form an inter-religious peace group in the Central African Republic. He also called on governments to do their best to uphold Article 18 of the Universal Declaration of Human Rights upholding the freedom of religion. The Prince has become one of the most high-profile names to speak out about the persecution of Christians. In September he wrote a letter to Chaldean Patriarch Louis Raphael Sako, stating that he was 'heartbroken' by the situation in Iraq, and explaining that he had sent a cheque to Aid to the Church in Need to help their work in the Middle East. 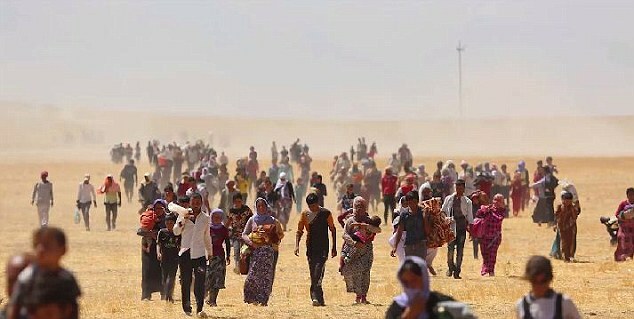 This winter the charity is launching its biggest ever drive to provide shelter, food and education to 120,000 displaced Iraqi Christians in the Kurdish-controlled north of the country. The report by Aid to the Church in Need includes an introduction by Dr Paul Bhatti, brother of murdered Pakistani minister for minorities, Shabhaz Bhatti.The report concludes that of 196 countries in the world, 81 countries – or 41 percent – are identified as places where religious freedom is impaired, either 'high or medium', or is in decline. Of the others, 18 per cent were 'of concern' and the remaining 41 per cent included 'no concerns'. 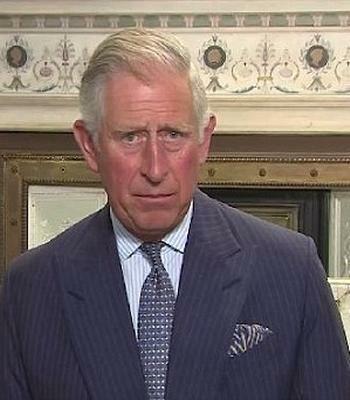 Prince Charles's comments come as a Christian couple were beaten to death and burned in a brick kiln in Pakistan for allegedly desecrating the Koran. The killing took place in the kiln where the couple worked in the town of Kot Radha Kishan in eastern Punjab province, police said. The attack is the latest to target minorities in Pakistan for alleged blasphemy. Under Pakistan's blasphemy laws, anyone accused of insulting Islam or the Prophet Mohammed can be sentenced to death. However, the laws are often used to settle personal scores and target minorities. Shahbaz Sharif, the top elected official in the province, has ordered a probe into the incident. 'The horrendous and heart-breaking events in Iraq and Syria have brought the subject of religious freedom and persecution to the forefront of the world's news. 'Sadly, incidents of violence in Iraq and Syria are not isolated. They are found throughout some, though not all, of the Middle East; in some African nations; and in many countries across Asia. 'Thankfully, despite this bleak picture, there are inspirational people of different faiths joining together to overcome division and hatred. 'It is a well established principle of inter-faith dialogue that we judge each other by the best expressions of our faith, rather than our worst. 'Over several decades, I have been working to encourage dialogue and greater understanding between different faith traditions. Indeed, last December, I hosted a reception at Clarence House in response to the growing plight of Christians threatened by persecution in the Middle East. 'Having listened to their concerns, I did my best to highlight the gravity of the crisis. In February, during a visit to the Middle East, I attended an inter-faith dialogue which included key Christian and Muslim scholars and clergy during which we discussed the Christian-Muslim relationship. 'It is an indescribable tragedy that Christianity is now under such threat in the Middle East, an area where Christians have lived for 2,000 years and across which Islam spread in 700AD with people of different faiths living together peaceably for centuries. 'It seems to me that our future as a free society – both here in Britain and throughout the world – depends on recognising the crucial role played by people of faith. 'And of course religious faith is all the more convincing to those outside the faith when it is expressed with humility and compassion, giving space to others whatever their beliefs. 'With this in mind I would like to suggest several tangible courses of action which I believe might be helpful. 'First and foremost, rather than remaining silent, faith leaders have a responsibility it seems to me to ensure people within their own tradition respect people from other faith traditions. 'We have yet to see the full potential of faith communities working together, however, to do this effectively requires not only maturity in one's own faith but also in essential humility. 'I believe that to speak to another faith tradition and to defend those who follow it, it is profoundly helpful to speak from the core of one's own core spiritual experience. 'My own Christian faith has enabled me to speak to and to listen to people from other traditions including Islam and, as Pope Francis has recently said, such interfaith dialogue is a necessary condition for peace in the world and should be seen as a duty for all Christians, as well as for believers from other religious communities. 'These seeds of hope can germinate even in nations and regions torn apart by war and violence. 'Secondly it is essential that governments honour their duty to uphold the right of people to practice their faith. They are heavily restricted. Royalty is not allowed Public criticism or Parliament smacks them down. Q: What is your theory as to what exactly is going on in the world right now? Right now the Jesuit Order is gearing up and their in the starting stages of publically taking over of the Middle East in the new Crusade to destroy the Vatican created Islamics. Remember Islam was created by the Papacy around 595 thanks to ex-nun Khadija for the purpose of takeover and conflict in the future. The Jesuits plan well in advance.. Right now the aim is to create confusion and chaos. The motto of the 32nd and 33rd degree freemasons and possible 31st and 30th is ORDO ABCHAO which is Latin for Order out of Chaos. In order to establish the New Atlantis commonly known as New World Order the chaos has to increase. By increasing chaos you help scare the sheeple public into demanding a one world government and all their sneaky plans to go with it. At this very moment we have them ramming Bird Flu down our necks, Terrorism and natural disasters all day long. They love to forget about Laser satellites which manipulate and create weather patterns. They love to forget about HAARP and Chemtrails and their effects on the weather. We’re scared about the climate but not told that all the planets in the solar system are changing most the same as us and others in the opposite direction. We’re scared about the Ozone layer when really this is a complete scam. Have you ever wondered why they only ever look for and find holes in the so-called Ozone layer at the poles? This is the only place there would be holes due to the lack of Oxygen support from plants etc and also something to do with the poles themself if I remember correctly. This is why there's no Ozone holes over New York, Sidney, London, L.A etc and if anywhere on this world would have them it would be these cities, but nothing!!!! What do the people do? Fear spraying cans and throw out their fridges, spending more money on new ones and doing the right thing so they think! Q: Who are the Jesuits and Count Peter Hans Kolvenbach? The Jesuits from the 4th Vow are the rulers of this planet and have been since 1846. They were formed by the first Black Pope Loyola properly addressed as The Superior General. He swore allegience to the Pope to help destroy their enemies and regain control of the world under one leadership again, which is Roman Catholic for now. Since 1540 they have been feared because the Jesuit Order is the most powerful society on Earth and this is how its kept control amongst what many call the elite. The Jesuits kill Popes which should easily show you their power. Many in the Vatican detest the Society of Jesus and its ways but quite frankly cannot do anything about it. Once the Pope was made the Infallible Prince that was it, the Jesuits gained control of all the governments etc. This created the final pyramid in order to gain full control, this is how the small rule the few. Popes hate being Infallible as it makes them subject to Rome! The Jesuits have all the knowledge and wealth most of which they steal. Just look at their 4th vow Oath and Instructions its terrible how they think and react. They remind me of Chameleons, the Jesuits change into their enemy in order to take over and destroy. Q: What is the extent of the Jesuits power? Saturnalia has a good grasp on Jesuits. He thinks that Jesuits are being zionists - which my reaction to that (it might be an year ago..) was sceptical - thinking over it over and over very often and checking options - it is possibility to me today. Vlastimil, much of the information leads to this conclusion. When you research the Inquisition and all throughout history you will see a pattern of that which paints a picture that is very surprising and suspect. So much deception, lies, trickery, and just outright disrespect for humanity...in this view there is only one conclusion. Then I ask myself, "who is the father of lies and deception?" This doesn't bode well for anyone in leadership. When we compare and contrast the truth vs. what has been told to us; we find differences which were hidden from us for the purpose of controlling outcomes, populations, money, humanity and all that we as humans require to live. Who does something like this? I support the Royal Family; not as masters but as having a vital and indispensable role in society. It wasn't always so. They provide continuity in a lifetime of otherwise continual change. During Queen Elizabeth's reign there have been thirteen Prime Ministers and incredible changes in society; in technology, the arts and sciences. The world now bears little resemblance to how it was in 1953, the year of her coronation. Yet throughout all those changes, the nation could be reassured by the presence of her majesty, providing continuity from one year to the next; from one decade to the next; and the royal family, from one century to the next. That is not to say that it should be fossilised in the past. The role may not change but the way it is carried out could adapt as necessary; indeed, it has to. I would like to see a time when we are all free: when the Queen does not have to suppress her emotions; when Prince Charles can speak his mind without fear of stepping out of line; when William and Kate can take a romantic stroll down The Mall late one night without being surrounded by hordes of paparazzi; when we can all participate in preserving the best of our nation's culture and heritage, while embracing promising developments for a better future. We have to effect fair and open dialogue. We have to support the truth in all circumstances and we must honor The One Creator who resides within us giving us the ability to live within this construct. Then we have to effect truth in governance and humanity that is desperately needed. And we have to deconstruct a system that was built all around us which subverts our rights and remedies under the Rule of Law..
Every man for himself and our Creator The One for us all...we cannot honor the created and set aside all of the Universal Laws written in the Cosmos by The One for humanity...shanghai humanity in service to self with no consideration for those who have not chosen to be controlled under deceptive and hidden agendas. Who we are? We were born with all the knowledge and ability to govern ourselves...see, we have a conscious and a soul which is captured all in love...this love is our guide and gives us the ability to discern and a knowing that no book or person can teach us. Gaining the ability of full consciousness is necessary and important in this construct, to better understand what we are here for. The ability to see that there is no power on earth and in heaven that can compromise our ability to live forever...in this we have the power to imagine all that is good and wholesome and effect this in our lives. We are awesome creatures created by an all powerful One...we are limitless!